The consultation can take up to one hour. During this time questions on your health, family history, lifestyle, diet will be taken. It is useful if you can provide any details of medications that you are taking and results of recent blood tests. It is only after this detailed questioning and a close examination of your scalp and hair that a diagnosis can be made. Once diagnosis has been made, advice will be given, and only if thought necessary will treatment be offered. 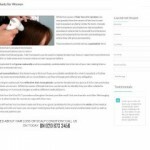 As a leading provider of Scalp and Hair Treatment, we take pride in offering the best advice and treatments. We are dedicated to serving the needs of our customers each and every day. There are many types of hair loss, which can and do respond to treatment. There are also some types of hair loss, which can have a natural or spontaneous recovery. Excessive hair loss can often be a symptom of some other problem or variation in the metabolism of the body, and for this reason, your GP may also need to be consulted. Problems of the scalp, ranging from dandruff to more inflammatory conditions can be caused by stress, poor diet or even some allergies to certain foods. These can be responsible for the build up and shedding of dead skin cells. Here guidance on diet and relevant topical products are recommended. Hair texture problems can be caused by over exposure to heat or strong chemicals, or by many other stresses and strains. Hair texture problems usually respond very well to appropriate advice and treatment, as the cause(s), once discovered, can often be reduced or eliminated altogether. Concerned about hair loss or scalp condition? Call Us On Today.